Kathy Schrock's Kaffeeklatsch: An interactive white board in your teacher tote bag! An interactive white board in your teacher tote bag! Learning Resources recently sent me their new now!Board, a tiny, portable, interactive whiteboard tool, to review. What a neat device! 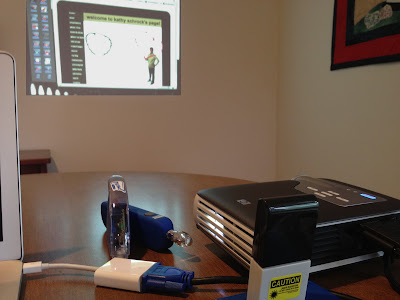 It turns any surface into an interactive whiteboard and all you need is a computer and a projector! Those of you who follow me know that I love cases, and the main components fit nicely in the included 10" x 7" x 2" case. To set-up the now!Board, I simply installed the software on my laptop, hooked up a projector, hooked the now!Board camera via USB to my computer, and placed it about 12 inches behind the projector, pointing at the surface I was projecting on. I launched the software, adjusted the angle of the camera, and started to calibrate the now!Board on the wall in my house. It was hard to find a blank wall in my house and the projected image was extremely keystoned which made it difficult to calibrate all the points. I decided to find a dry erase board at the right level and try again. Once the projector, image, and now!board camera were pretty much level with each other, the calibration was a snap! I used the handheld stylus on the right for calibrating. This was also the stylus I used for the movie below. This stylus is intended for use with a dry-erase board or regular whiteboard. It has the ability to right-click, too. The 24" wand (on the left in the photo) is for using with surfaces the handheld stylus might scratch up or for younger students so they can reach the projected tools and images. The tool set in the software offered all the necessary IWB tools including screen capture, scaling, an on-screen keyboard, blank whiteboard desktop, and more. I did a short Jing screencast of my computer screen as I used the now!Board software tools via the handheld stylus on the dry-erase board. The now!Board would come in very handy for sharing among classrooms and rolling computer carts, since nothing has to be mounted on the wall or classroom board to hold it, any surface can be used to project on, and it is very easy to set-up and calibrate once everything is close to being on the same level. Teachers have asked me if the now!Board can be used with an iPad in the mix. I decided to test out some options. I first hooked the projector and the now!Board camera to the computer and launched the now!Board software. I wirelessly streamed the computer screen to the iPad screen via Splashtop Remote and Splashtop Streamer. I could not use the tools effectively, though, using the iPad as the "stylus". I could definitely use the arrow and control file menus and such and pick any tool on the tool menu. But I had a hard time highlighting and drawing. I was envisioning that someone could be at the projected image using the now!Board stylus and someone else could be remotely using an iPad, but that did not pan out as a viable option. It was only a trial run to see what would happen and who knows what will be available for the iPad in the future to make it work! Here is a brief hardware set-up video, produced by the company, to give you a better feel for the hardware set-up process. A series of tutorial videos come on the software CD. And here is the short (2:35) product video, created by now!Board. The now!Board portable interactive whiteboard device will start shipping in April of 2012. You can find out more about it and order it for $499 at the Learning Resources site now. You can also follow them on Facebook to keep up-to-date! Last last week I received the new wand for use on surfaces that the hand-held stylus might scratch up. It worked perfectly for calibrating, marking up a projected page and using the menus and on-screen keyboard in the now!Board software on the Mac. Below is a quick photo of my set-up and a screenshot taken from the software.